The Rienz Ski Centre is ideal for beginning skiers, and is particularly suited to families with kids. Skiers and snowboarders who are looking for practice while having great fun will also feel at home here. And there is the Trenker slope to challenge and satisfy even skilled ski enthusiasts: in fact, the Swiss national team and others train here. Half-day ticket: starting from 12 a.m.
Skitest-Card: starting from 2 p.m. 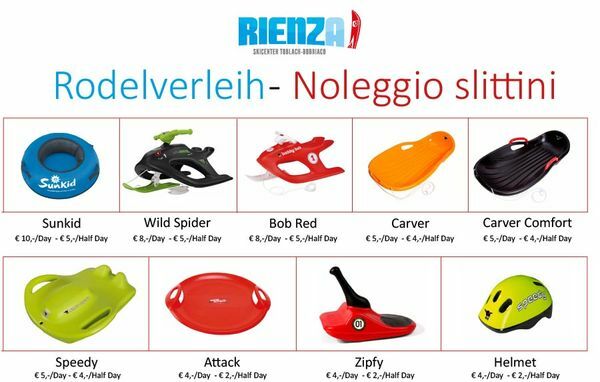 In the skiarea Rienza you can rent a number of cool toboggans and bobs specially for kids.